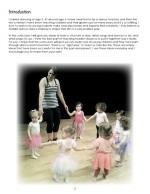 Maria of Maria’s Movers has been writing for Dance Advantage for two years, bringing wonderful advice and years of experience to her posts about working with your littlest dancers. We love Miss Maria! Several months ago I released a toddler curriculum that I worked for years to develop. It was a big day! On my blog over the years, I have had many teachers ask if I had something they could purchase. Since I had been teaching the lessons to my own students I thought I would share it with my blog readers too. 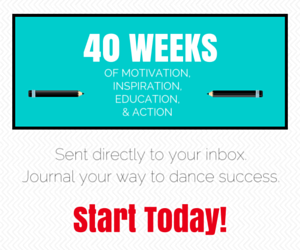 I wanted to make it affordable and useful for new dance teachers and share what has been successful for me over the few years I have taught my youngest students. If you are just starting to teach grown-up and toddler classes, this is for you! It’s a 24 week curriculum (6 lessons) that offers song and music suggestions, prop ideas, advice on how to manage a room full of toddlers and their grown-ups, tips on transitions and a lot more! I would love to giveaway 2 digital downloads to two toddler teachers who could benefit from new ideas this new year! If you would like a chance to win, visit my blog to check out what you’re getting, then come back to leave a comment below sharing your most favorite part of teaching toddlers. TWO teachers will be chosen at random from the comments. This giveaway is open worldwide but you must be 18 or older to enter. We will close the comments on Sunday, March 9 at Midnight EST. Good Luck! I recently opened up a new dance studio and I have one Creative Movement class at this time. This class has proven to be one of the more difficult and yet more exciting class to plan for. Then I discovered it’s a class you don’t plan, but prepare. My favorite part of teaching toddlers is the abundance of creativity that fills the space. I set a teaching goal and direction for the class and then give the little geniuses the opportunity to expand, express, and empower themselves with ideas of their own. Whether we’re pretending to be in the castle’s tower (a hoop) to practice our tendus or fairies skipping over the lily pads (drawer pads) to work on leaps, it’s a collaboration that excites both teacher and student. They return to class each week with more and more ideas (and better knowledge of and execution in movement) that has served them well in and out of class, and perhaps will for a lifetime. I love teaching toddlers because it keeps me on my toes! They always present a new challenge and as a teacher, I enjoy learning new ways to engage young dancers. I think my favorite thing about teaching toddlers is sharing in their excitement and achievements. Their innocence is so refreshing! This looks great! I am always looking for new ideas! This is my first year of teaching littles after over 30 years with teenagers, and I learn something every class. I love their willingness to embrace new ideas and enjoy silliness . . . not to mention the energy they bring. Great stuff! I love the enthusiasm that toddlers have for just about everything! They have a willingness to let go and just be silly. Dance and movement in particular is a great way to encourage their developing personalities and have fun! My favorite part of teaching toddlers is to see their faces light up when it is their turn and they execute a dance step across the floor. My favorite thing about teaching Toddlers is to expect redirection that usually ends up to be more fun than what was originally planned in the first place! I love the ability to change a focus depending on a mood, a like, a dislike, or an ability. It took me a while to adapt, but I enjoy getting off my organized track onto a different track when needed. I would definitely have to say that it is finding out how much they are capable of, because minis are able to do so much more than most adults think. It is so much fun to explore what is going on inside their little heads while never knowing how they might react and what they might do next! I check the Maria’s Movers blog often when I need inspiration for teaching and would love to have this curriculum! I just opened my own dance studio and am trying to build a pre-school dance program. I can use all the help I can get 🙂 For me, teaching toddlers is a very selfish thing. They give ME so much energy and keep me young with their enthusiasm for learning. I love how excited they get when they master a new skill and their imaginations inspire me everyday. My favorite part of teaching toddlers is when they think of something I never could have (a way to use a prop, a way to mimic an animal, etc). There is just no way my imagination could ever compare to theirs! I love teaching toddlers because they have tons of energy and an amazing imagination. Thank you very much, Maria! It’s very kind of you sharing your experience with more teachers. My favorite part of teaching toddlers is the love they have to share with uninhibited abandon! Their enthusiasm and funny things they say and do keep me young. Hopping like a frog and whirling like leaves in the wind are part of my day-how lucky am I? The most rewarding part of the dance experience with young children is their discovery of their sense of who they are and how they can use their imaginations to play and dance. It is especially heartwarming to witness this action between parent and child. The parent gains a whole new understanding and their relationship with their child blossoms into something unexpected, pure and utter joy! There are so many favorite parts of teaching toddlers. I guess one of my favorites is looking into the childs’ eyes when she is telling me something. The eyes are earnest, honest and engaging! They are all precious. I think my favorite part of the toddler class is the random and odd twists the class can take in a matter of seconds! One moment you are working on balance and the next you are walking on a vine over a lake of lava. Their imaginations are wonderful! I love how excited children are at this age; when I get our parachute out for game time, these kids light up with excitement. Also, I love being able to be silly with young children – you have to enter their imaginative world when you teach them, and that’s a blast! I love my job!!! Mums tell me that I’m the new Santa Claus in their homes, to try and persuade the children to do something or listen! I love all the hugs and kisses I get at the end of each class! It’s the most rewarding job in the world! Watching the most timid children grow into confident little people is incredible! I feel very blessed! Just ready the blog has given me other ideas with my little ones. It’s easy to get into habit especially around recital time. I hate when I feel this way cause I am sure the tiny dancers get bored too. I love the drum idea! I see on the blog that the mommy and me class is 18months to 24 months. 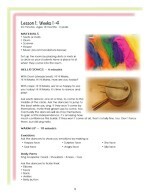 I have never tried this type of class but would love to start since I have a 10th month old. My favorite part of teaching toddlers is watching them grow and blossom into well trained, free spirited dancers, who return back to me 15 years later with sparkle in their eyes. They remember the first year like it was yesterday the innocence , the fun and the foundation in which has given them purpose and direction to pursue their dreams of becoming a dancer like me. My most favourite thing about teaching toddlers is the invigorating energy we share. I actually feel more energized during and after working with wee ones. They seem to just beam excitement and curiosity which in turn compels me to try and see things through eyes – and then I feel like a kid again. I know they are learning from me; but I’m learning from them too how to find my inner child! I love being a part of their little world and being able to offer them something they will carry with them in their hearts as they grow! There are so many reasons that I love teaching toddlers. When they smile, when they succeed, when they learn something new. But above all…there are those wonderful moments where I actually learn from them. Learn how to embrace what is there instead of fighting for what’s not. Learn how to be honest. Learn how to be yourself, without apologizing. The nature of the toddler engaged in creative movement constantly reminds me of all these things! I find total enjoyment in their creativity, energy and the cute things they say. My favorite activity to do with them is bringing out props and pretending we are pirates or princesses going on adventures as we create dance moves that help us through our imaginary journey. The ideas they bring are better than my own. I learn so much from them! What I love most about teaching toddlers is that they are a clean slate as dancers. I’m given the privilege of instilling a love of dance in them while simultaneously teaching them all the fundamentals they need to know for a successful dance career, whether it be short-lived or lifelong. My dance teachers continue to be extremely important people and role models in my life, and I cherish the opportunity to provide that support, leadership, and inspiration for the young ones I teach. After 12 years of teaching dance to teenagers, I finally worked up the nerve to take over my tiny tots program and I fell in love. My favorite part is that they are so happy to be there for the most part and they are so much fun. My stresses disappear when I walk in. It is wonderful. I just started teaching a toddler dance class this year and I’m surprised at how much I love it! They come in with such anticipation and try (most) everything which such gusto. And there are boys, which adds such a fun layer of energy to the studio. I’d love this resource with perfectly age-appropriate ideas! What a great resource to have. My favorite part of teaching toddlers is when that shy beautiful child lets go of mom or dads leg and moves into the center of the rest of the group all by themselves. I think is the same feeling I still get right before we go on stage even as a professional dancer.